The appeal of the good life knows no boundaries. But while some are born with a silver spoon, some have to steal gold tiffin boxes. 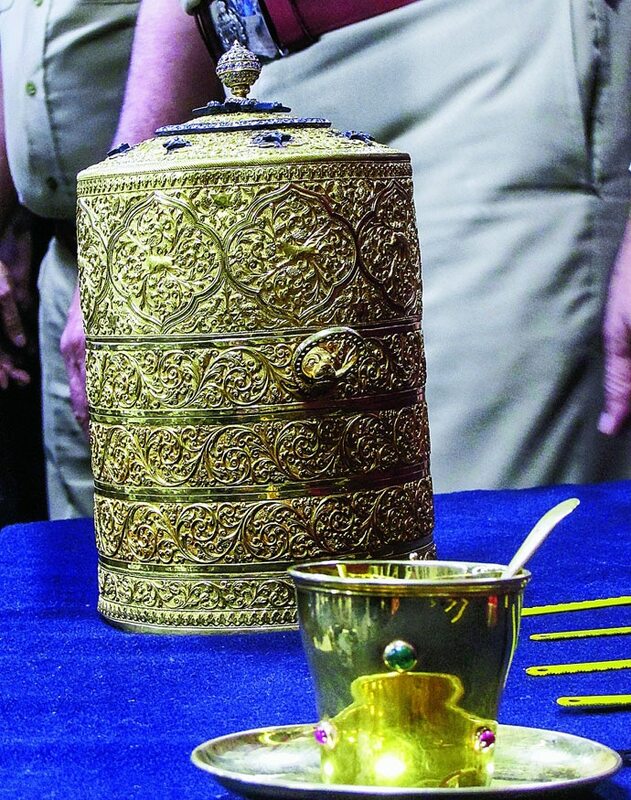 The Hyderabad police recently arrested two people who allegedly stole a tiffin box — three-tiered, weighing 1.9 kg, made of gold and inlaid with diamonds and rubies — a gold cup and saucer studded with precious stones, and a gold tea spoon, from the Nizam Museum in Hyderabad. The rather extravagant dining items belonged to the 7th Nizam of Hyderabad, Nawab Mir Osman Ali Khan Bahadur. It is not known if the Nizam himself ever ate in them, but Mohammed Ghouse Pasha and Mohammed Mubeen, according to the Hyderabad police, well enjoyed the fruits of their labour. Their motives behind the stealing, say the police, were not entirely material. The two, who are cousins, wanted a feel of the Nizam life, and in the seven days between the theft and their arrest, bought food and ate in the museum pieces every day. Also, there is honour among thieves. In the museum, the duo also spotted a gold-covered Quran, but just as one of them was about to pocket it, the morning azaan (call to prayer) rang out from a nearby mosque, and they contented themselves with pinching the more secular items. The Hyderabad case is by no means the only instance of enterprising people finding riches at museums across the country. 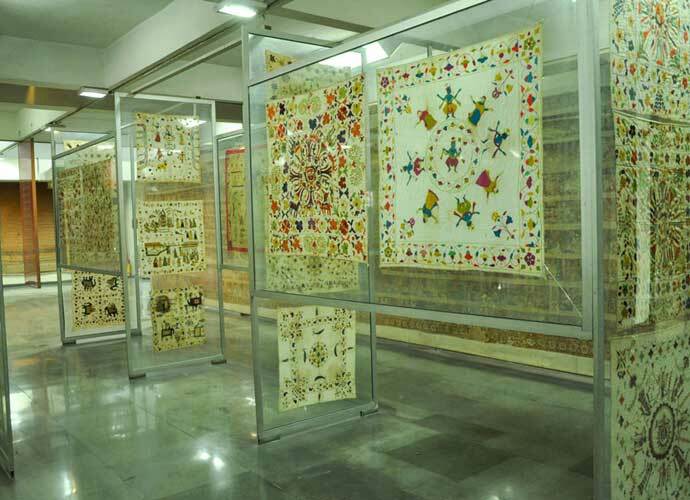 In November last year, the Crafts Museum in Delhi hit headlines. Sixteen Pashmina shawls, worth Rs 2 crore, had been stolen. As the probe progressed, this tale of crime and detection turned out to be as intricate as a beautifully woven Pashmina. According to the police, Vinay Parmar, a Delhi resident, first managed to convince museum staffers that he was a researcher, and would soon take over as their boss. He "worked" there for two months, during which he zeroed in on the 16 shawls and figured out the entry and exit routes. Days before the crime, Parmar conducted a dry run, where he managed to get locked inside the museum and then shouted at the security staff, who apologised and told him the CCTV cameras did not work. Armed with this information, Parmar and a cousin then stole the shawls on a Sunday, as the museum is shut on Mondays and the theft would not be discovered till Tuesday. The two were trying to sell the shawls when Parmar’s SIM card gave him away in Kolkata and they were arrested. According to the police, Parmar got the idea of targeting a museum from Hrithik Roshan’s character in Dhoom 2. In June this year, a replica of the ‘Olduvai Handaxe’ was stolen from the National Museum in Delhi. The handaxe is millions of years old, and is an important marker of the evolutionary journey of man, as he learnt to manufacture and use tools. The probe at first seemed too simple — there was a CCTV camera right above the shelf where the artefact was kept, and a man could be seen slipping it into his pocket. The police found his address from the museum’s visitor book and went to arrest him. It was here that things turned exciting. The man, Udai Ratra, was reportedly drunk, and refused to open the door. There were around 10 dogs on the premises of his house, who also took offence to the presence of the police. The officers had to lie low, and finally nabbed him as he left the house late at night. Ratra, who had a criminal record, later told the police he was a “kleptomaniac” and could not help pocketing the handaxe. Also in Delhi a few years ago was reported another museum theft. 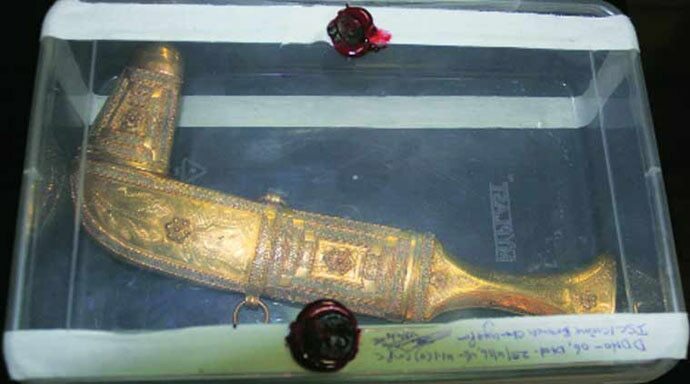 In 2016, a dagger that had been gifted by the Saudi King to former Prime Minister Pandit Jawaharlal Nehru was stolen. The theft took place on a holiday, and hence the role of staff members was suspected. This was not much to go with — the museum has hundreds of staffers — till a policeman realised the case showcasing the dagger had been smashed from the left side. This pointed to the involvement if a left-handed person. After sustained questioning, the police found out about a santiation worker who was known to bat both left- and right-handed while playing cricket. The talented batsman was arrested, who confessed that he, along with another staffer, stole the dagger to pay off their debts. The last item in this list is from a museum that could never take shape, yet has seen multiple "thefts". The offices of Air India offices across the country are repositories of priceless paintings and artefacts. 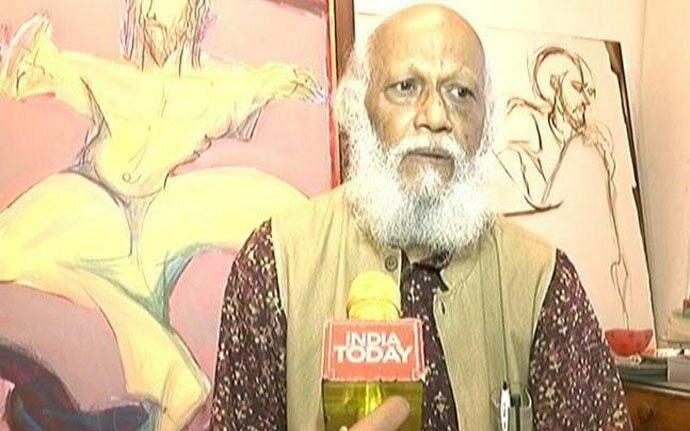 In 2017, celebrated artist Jatin Das got a call from an art gallery to authenticate one of his works. The work in question, The Flying Apsara, had been commissioned by Air India in the 1990s, and was supposed to be their property. Das informed the national air carrier, and the resulting enquiries led to the discovery that a number of former senior airline officials had used these paintings to decorate their homes while in service, and then ‘forgotten’ to return them. Around the same time, Air India was also planning to put up all its paintings in a museum, and as they tried to draw up an inventory, officials realised that several priceless paintings had similarly 'gone missing'. Neither have the paintings been traced, nor the museum materialised. The Jatin Das painting, however, was returned. It was couriered to the Air India office in Delhi from a fake address, folded up like any piece of paper. Also read: Mark Knight's Serena Williams cartoon is funny. But how did we miss that?